TOMAR'S KA-BAR KNIVES-BK62 BECKER KEPHART Fixed Blade Knife. TOMAR'S KA-BAR KNIVES-BK62 BECKER KEPHART Fixed Blade Knife. 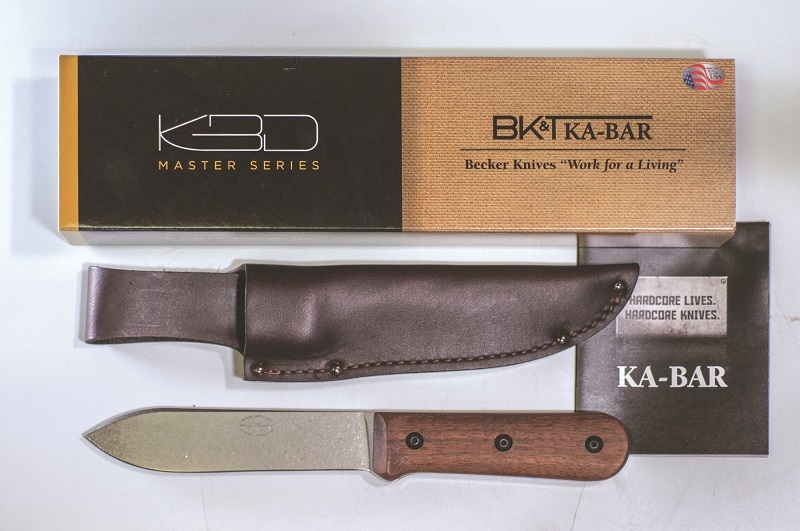 KA-BAR has just released the BK-62 KEPHART which is a solid one piece designed knife featuring a 5.125" straight edge blade constructed of 1095 Cro-Van steel with a HRC hardness rating of 56-58 which has been flat ground providing a sharp cutting edge with excellent edge retention. The three bolt scales are made of hardwood Walnut with natural wood grain appearance providing the user a smooth and well controlled handle. The overall length of the KEPHART is 9.688", has a blade thickness of 0.158" and a blade width of 1.25". This knife comes with a brown leather belt loop sheath. This knife is made exclusively in Olean, New York U.S.A. and proudly blade etched with the Becker Knife & Tool / KA-BAR brand name.